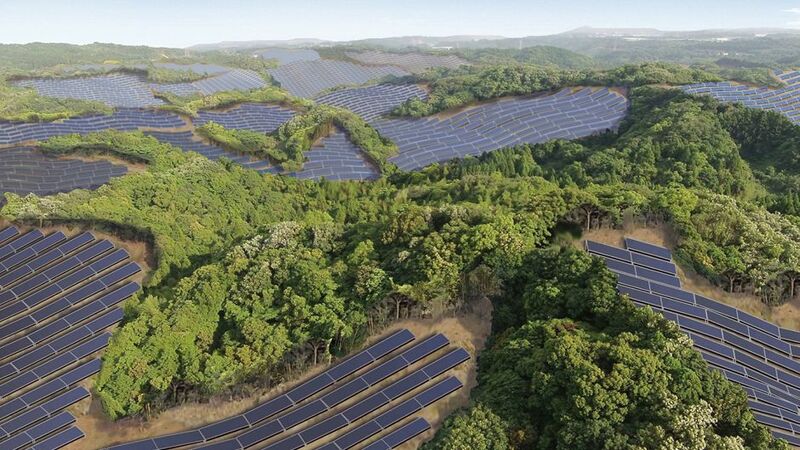 A partnership of Japanese companies will soon begin building a 92-megawatt (MW) solar power plant on a former golf course stretching across Kanoya City and Osaki Town in Kagoshima Prefecture. The project will become one of the largest solar installations in Japan. In the wake of Japan’s 2011 earthquake and nuclear disaster, some are questioning the government’s conviction that nuclear power offers an indispensable path to a lower carbon future. There are indications that the government’s intentions to lower emissions levels by bringing back nuclear power are overly optimistic. Japan’s current government, led by Prime Minister Shinzo Abe, appears hopeful it has already set the country back on track to the widespread use of nuclear energy. This is evident from the government’s stated intention to go from zero nuclear energy after the Fukushima disaster to a projected 20 to 22 percent of national electricity supply by 2030. The country has only recently (one in August, one last week) reopened the first two nuclear reactors since all were taken offline due to safety concerns following the 2011 disaster. Both are reactors at the Sendai nuclear power plant, owned and operated by the Kyūshū Electric Power Company in Kagoshima Prefecture. Bloomberg, however, forecasts that anti-nuclear sentiment in Japan means the 20 to 22 percent target for nuclear power by 2030 is unlikely, with a 10 percent proportion more plausible. The business news service points out the government’s goal would require 13 reactors being extended beyond their 40-year lifetime. Meanwhile, another recent news report indicates that legal challenges and concerns about nuclear safety mean that only seven of 42 operable nuclear reactors are likely to be turned back on during the next few years. Yasushi Ninomiya, a senior researcher with Japan’s Institute of Energy Economics, agrees that the percentage of nuclear power in Japan is unlikely to exceed 10 percent due to the government’s overestimation of national energy demand based on a yearly average of 1.7 percent gross domestic product growth. “Japan’s declining population and the shift of its manufacturing industry overseas means this figure is likely to be considerably lower,” Ninomiya told me recently in a personal communication. Some question whether it is time for Japan to move beyond the nuclear–coal equation to escape the climate conundrum (which I described in a previous article) stemming from the growing use of coal and subsequent rise of emissions since the country’s shutdown of all its nuclear reactors after the earthquake. Ninomiya said far more renewable energy could power the country beyond the current target of it providing 20 to 22 percent of national electricity production by 2030. This would be possible by further liberalising the national power market and developing new industries. “Japan’s economic security would actually be advantaged in the long run by a move to more renewables,” contends Bloomberg New Energy Finance analyst Ali Izadi-Najafabadi. Ali Izadi-Najafabadi, an analyst with Bloomberg New Energy Finance’s Tokyo office, told me that a shortage of enthusiasm for more ambitious renewable energy targets was the result of a general tendency within the ruling Liberal Democratic Party (LDP) to support coal and nuclear. He was quick to add, however, that any “climate conservative” streak within the LDP had not translated into politicians publicly repudiating the science of global warming, as has been the case in some Western countries. “The LDP’s support for coal in particular is based on an ideological belief that Japanese technology is very good and that its high-tech, low-emission coal combustion represents the most affordable technology of energy production,” said Izadi-Najafabadi. It is evident, though, that not all Japanese politicians support nuclear energy. The opposition Democratic Party of Japan (DPJ), which was in power at the time of the Fukushima disaster, has stated nuclear power could be totally phased out by the 2030s. Former prime ministers Natao Kan (DPJ) and Junichiro Koizumi have also criticised the current government’s proposed path back to nuclear power. Koizumi, in office from 2001 to 2006, campaigned on an anti-nuclear platform while supporting another former prime minister — Morihiro Hosokawa — in his ultimately unsuccessful bid to become Tokyo governor last year. Izadi-Najafabadi said Japan will eventually follow Europe and the United States in promoting the escalated use of renewables, but this is likely to take time and will probably require Japan’s industrial leaders, rather than its politicians, to show the way. Japanese industry is actually further developed in supporting advances in renewable technology than many outside the country realize. While China has stolen the limelight in terms of its huge move during recent years into the renewable energy market, it is less known that Japan represented the world’s second biggest solar photovoltaic (PV) market in 2013. It accounted for 10 percent of the global total, compared to 13 percent for China. This entailed an impressive doubling of PV capacity in Japan from the previous year. The Climate Group recently reported how cutting-edge Japanese solar technology was behind the recent opening of one of the world’s largest floating solar panel plants in central Hyogo prefecture. Japanese ceramics company Kyocera, which has expanded globally, developed the water-based technology to get around Japan’s lack of land space and to help provide the necessary cooling for a solar plant’s operations. Some believe Japan possesses the technical edge to make inroads into the renewable energy market. Though perhaps not in the rapidly aggressive fashion by which it made gains in the automotive industry in the 1980s, leading it to overtake the United States as number one automobile maker. Llewelyn Hughes, an Australian National University lecturer and Japanese market consultant, told me that because the cost of production in China is much lower, Japanese companies are not doing as well as they used to in the solar market. “This picture, however, can be misleading as some renewable production in China actually represents outsourcing from Japan,” said Hughes. Hughes pointed to a collaborative arrangement between Japan’s Panasonic and Tesla, a firm based in California perhaps best known for its electric cars among its array of high-tech products. As part of the collaboration, Panasonic’s innovation is helping to drive progress in battery storage, the “holy grail of renewables”, said Hughes. There are also signs afoot that Panasonic may be about make a more concerted push into the global solar market by supplying batteries for homes, beginning in Europe. “Japan could become a lead renewables technology market, and then export this technology to developing countries to help them leapfrog over the more carbon-intensive steps adopted by the developed countries,” says Llewelyn Hughes, an Australian National University lecturer and Japanese market consultant. Japanese companies’ collaboration with firms in China and the US to pave innovative paths to low-carbon development — based on high-tech cooperation and market force competition — calls into question the ongoing focus of state-based efforts to reduce climate change. While diplomats pore over obscure but highly politicised texts to broach an international agreement, companies are using the flow of ideas across national boundaries to find entrepreneurial ways to tackle climate change. Individual breakthroughs on new and innovative ways to seek profits across borders may help generate step changes leading to a low-carbon world, as has been the case with the Steve Jobs-led burgeoning communication revolution of tablets and smartphones. It is likely, however, that the positioning of nation states will continue to dominate news headlines about climate change — and this is an area where Japan’s climate reputation will likely continue to suffer. Japan’s increased use of coal brought by the sudden removal of nuclear power from its energy mix has made it far more difficult for the country to achieve domestic reduction targets considered credible by other nations. The sudden, tragic and disruptive nature of the 2011 earthquake helps to garner sympathy for Japan’s challenges in reducing its domestic emissions. Such considerations are likely, however, to be quickly forgotten when considering Japan’s ongoing support of coal mining and combustion in other countries. A report by a consortium of environmental groups released in June found that Japan is now the planet’s top public financier of overseas coal plants, technology and mining. The report found that Japan provided more than US$20 billion to coal projects in other countries between 2007 and 2014 — roughly a quarter of total international support for coal-fired power. During the same period, according to the report, Japan contributed about US$5 billion to coal mining projects around the world. Japan’s decision to continue funding coal mining and combustion overseas sits uncomfortably with the World Bank’s announcement in 2013 that it would stop financing coal projects, except in rare cases. Japan’s support for overseas coal plants in Indonesia (US$1 billion in loans) and India and Bangladesh (US$630 million) as climate finance loans has raised the most ire among environmentalists. The Japanese government has portrayed its support in pragmatic terms, arguing that some countries can only afford to use coal for their energy generation. In this view, Japan’s financial assistance means developing countries can build high-tech coal combustion plants that cause less pollution than those that would be built without such help. Japanese support “is a very practical and realistic and effective way to reduce carbon dioxide”, the Associated Press newswire quoted Takako Ito, a foreign ministry spokeswoman, as saying. As rising powers such as China and Brazil move to wind down their coal use, new coal plants in Japan are likely to face increased business risks. This issue has set off deliberations within the United Nations (UN) Green Climate Fund, the main international body channelling aid funds to help developing countries mitigate and adapt to climate change. The UN body’s current stance — where the use of climate finance to support coal plants is not explicitly banned — is likened by Karen Orenstein, a campaigner for Friends of the Earth US, to a “torture convention that doesn’t forbid torture”. Japan’s support for advancing coal in developing countries is likely to remain a weak spot in Japan’s diplomatic armour, opening it up to continuing overseas criticism. The power of the market, though, may ultimately play the biggest role in weaning Japan from its current support for coal projects in developing countries. As rising powers such as China and Brazil move to wind down their coal use, new coal plants in Japan are likely to face increased business risks. Conversely, current low demand for coal may allow Japanese utilities to seek lower prices. However, in the longer term, Japan’s current investments in coal at home and abroad could well prove to be a losing bet. Predicting future global trends is rarely straightforward, but judging by the perennial air pollution and high percentage of emissions caused by coal, it is unlikely this fossil fuel will be the energy source of choice for current and rising powers. The government’s faith in nuclear power is understandable considering it has served the country well prior to the Fukushima Daiichi disaster. Fears about nuclear energy are, however, unlikely to dissipate quickly — especially in the only country that has borne the brunt of nuclear weapons. It seems then that the government’s current bet in putting renewables just below coal, and on a par with nuclear energy, threatens to push Japan out of a global growth curve leading to a low-carbon world based on renewable energy. Japan’s Narrowing Nuclear Path to a Low-Carbon Future by Simon Pollock is licensed under a Creative Commons Attribution-NonCommercial-ShareAlike 4.0 International License. In fact, the second of the two recently-restarted reactors is in Kyushu’s Sendai, ironically in the same Kagoshima Prefecture as the new solar installation proposed in Kanoya. The first reactor to restart is far north, in Honshu’s Sendai, Tohoku’s largest city. Haha! Well, Carol, that’ll teach me to make assumptions, particularly after pointing out what was likely one from someone else 😉 In any case, thanks for correcting. And aside from that little embarrassment, I’m doing well! It’d be fun to catch up. No, embarrassment please! Love to hear from you and yes, a catch up would be great. Do you ever make it to Vancouver? !